For those of us in the northern hemisphere, this is the winter solstice celebration. For some pagans, Yule is a 2-lunar month celebration starting with the Arra Geola moon (late November/early December). In the second vein, the solstice itself is Mother's Night, and some start their celebrations then and continue them through to the New Year. It's about your personal beliefs and preferences, as well as the spiritual tradition you follow, and if you are in a coven, what they believe and follow. How do you celebrate Yule? As mentioned above, the time frame for celebrating Yule can vary. The traditions, however, are similar. What do I do for Yule? 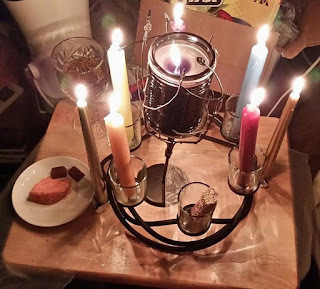 I try to set up a small altar, like I do on every sabbat. I use mini bundt pans to make Yule cakes. I use vanilla cake mix and replace the water with egg nog. I use sour cream instead of oil and an extra egg. Once the cakes are cooked I use vanilla frosting with a little cinnamon mixed in and put sprinkles on. 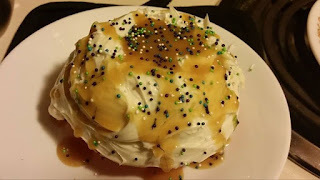 Then I smother it in caramel sauce. I place one on my altar and share one with my husband. I also make hot spiced cider to share. I give my friends and family small, homemade gifts, like cookies or bath salts.